Museums and Galleries actively promote understanding and enjoyment through experience-based learning. Education in museums and galleries offers a different experience to education in school, one that is difficult to replicate in the classroom. By getting out of the traditional classroom, children experience a different kind of learning, one that has a positive effect on their progress. The arts offer opportunities for children and young people to express themselves creatively and to experience the creative achievements of others. Touchstones Rochdale is the borough's award winning visual arts and heritage centre, incorporating a museum, arts and heritage galleries, local studies centre and tourist information centre all under one roof. The service is responsible for the acquisition, care, conservation and documentation of the Rochdale Borough Collections. It also manages the borough's local history collections, outreach displays and tourist information points in local venues. 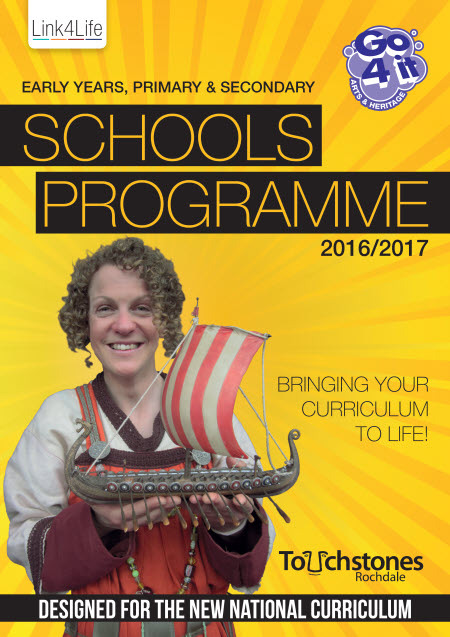 Touchstones Rochdale provides a successful annual education programme for schools each year. The services provided are highlighted in this section. Link4Life also administers revenue funding for a number of local community arts organisations in the Borough across a range of creative and visual arts and media. These arts activities can be commissioned through Link4Life and combine with sports and health activities to provide a broad and balanced programme capable of supporting curricular and extra-curricular needs. Our very popular Loan Box service is free to borrowers within the Rochdale borough. Each box contains original and reproduction artefacts designed to support history topics. Loan Boxes can be borrowed for up to two weeks at a time and can only be booked one term in advance. Self service visits to Touchstones Rochdale are a superb, cost effective way for your class to access arts, heritage and culture. A self service visit means that you have chosen to organise your own activities during your visit to Touchstones Rochdale. Booking is required in advance to ensure you have priority in display areas and help to avoid over-crowding in the museum and galleries. The Borough Collections and Touchstones Rochdale exhibition programme has inspired the workshops on offer. Workshops are developed in partnership with our team of facilitators, staff and partner organisations including schools. Inspired by the National Curriculum our workshops provide unique experiences for pupils to interact with real artefacts and works of art. 'Meet the Curator' is a fantastic opportunity for your class to meet an expert and the very person who has created the exhibition. Classes visiting the art gallery or museum can pre-book to meet a member of the curatorial team who will be delighted to pass on their insider knowledge. Talks can be tailored to your requirements and you are welcome to continue looking round or doing simple linked activities in the space afterwards. We can also arrange bespoke artists workshops for secondary schools linked to our exhibition programme. The Gallery team welcome younger visitors and to encourage self-service visits provide hands-on activities to complement exhibitions which includes a designated under 5s activity station in Gallery Two. (It may also be possible for a member of the team to meet your class for a short activity session). We offer CPD sessions periodically throughout the year, for example sessions which support cross-curricular learning such as the teaching of Eco-Schools topics using the museum's natural history collection as inspiration. Through this particular programme, participants are introduced to a range of creative disciplines that can be used to facilitate the teaching of sustainability issues. This includes music making, film making and crafts/painting together with practical co-operative business skills to raise funds through decorative bag making. The Local Studies Centre at Touchstones Rochdale holds the main Local Studies and Archives collections for Rochdale Borough. This encompasses a wide range of material relating to the area including maps, photographs and newspapers. Some of the archive collections are held offsite and can be viewed by appointment. Visits to Local Studies are free but, as with self-service visits, groups are required to book in advance. There is also an extensive online resource available through the Discover and ebook sections on the Link4Life website. The Arts and Heritage service has developed a number of heritage walks in the borough. These are an ideal way to discover more about the local history and heritage of the area. Guided walks can be arranged on request. Through a network of local arts providers, Link4Life can incorporate a range of high quality creative arts into the overall Go4it programme. Activities include dance, creative writing, circus skills, media production, poetry, musical theatre, music performance, sound engineering, environmental projects. A fully equipped performance space is also available for hire at Touchstones Rochdale with seating for approx 100 people. Please click here to read more about our venue hire. Cick on the image to view or download our digital brochure.